Last Friday I met Tamara. I can't quit thinking of her. I went into the hospital with a friend who was visiting and who had offered to get some video footage of the Outside the Bowl Ministry. I always have mixed feelings about any videos or photos - especially since I have lived here. These are our friends, people we serve. Many times it just doesn't feel right to snap photos - and we never do it without asking. On the other hand - I know their stories are important - if people understand the needs and see the faces they may be impacted to help. I know how that has happened in my own life. So we asked Tamara if she would share her story. She agreed. She told us she had given birth 3 days before. Her first child, a son, she has named Christopher. He was laying in the bed next to her - having just nursed he was sleeping peacefully. I asked Tamara if anyone had come to see her in the hospital and she replied that her mother dropped her off for her delivery, but it is not easy for her to come back to visit. We did talk about the Outside the Bowl meals she had been getting and she expressed her thankfulness - she explained that they were the only thing she had to eat since being at the hospital. She said she thought that another patient in the room would share with her if she had need of anything else. I told her what I know - that Jesus loves her and sees her and cares for her and her baby. She smiled and agreed and we put our heads together and talked to Him about her needs. Tamara just turned 15 years old. A young girl with a baby in such a hard place. 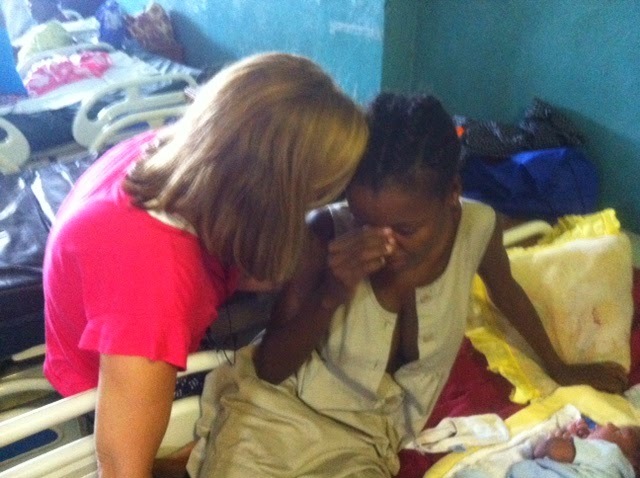 Will you pray too - that the Lord would provide for this Mom and her baby. I know the area she went home to - hard is not a strong enough word to describe it. Pray too that we would soon find a way to minister to these Mom's after delivery. Perhaps a church in the area - and an organization in the US that would sponsor daily meals there for new moms - maybe for the first month postpartum. And a Haitian ministry that would come alongside to disciple and love. The possibilities are as endless as the needs here.